Meet Tara Alan, author and photographer of cycle touring cookbook, Bike. Camp. Cook. It was written for adventurous travelers who want make healthy gourmet meals out on the road or trail. 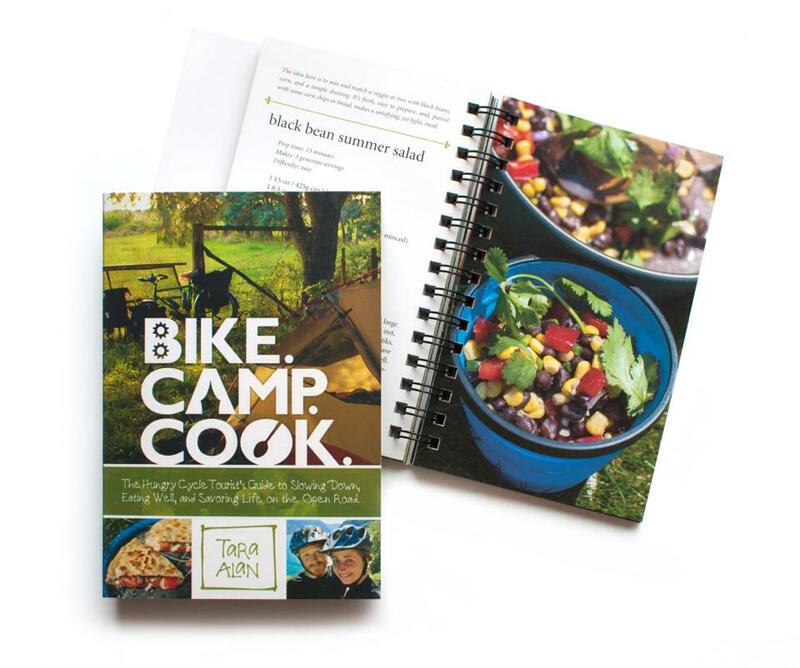 The cookbook memoir was based on a two-year bicycle journey documented at goingslowly.com. Learn how Tara makes outdoor cooking simple and demystifies travelling with fresh vegetables in your panniers. MK: Was cycling or cooking outdoors a part of your childhood, or is it something that you picked up later on in life? Tara: Cooking was definitely always a part of my life. Ever since I was a little girl, I loved cooking with my parents. They were really interested in whole foods and health, and I picked up a lot of cooking knowledge from them. I was also in 4-H as a kid, and I did an exhibit and won a blue ribbon for how to pack a picnic on an outdoor adventure! But I didn't get into the outdoors aspect of things for quite a while. 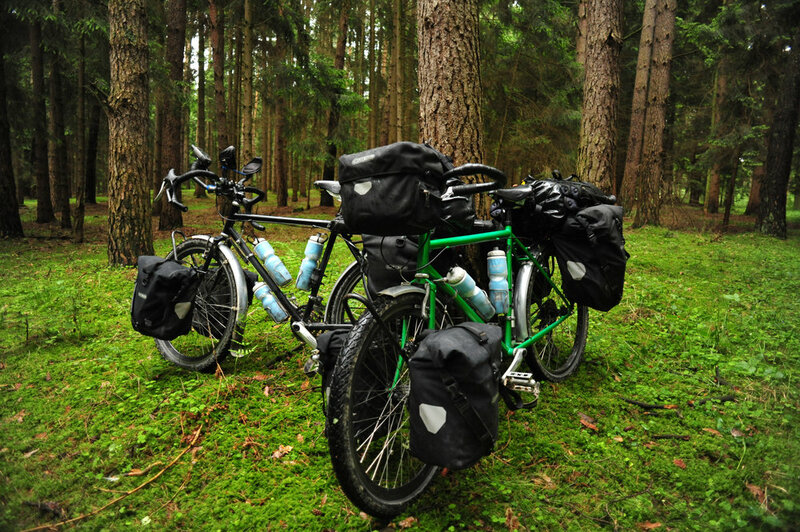 MK: Do you remember your first solo cycling trip as an adult? Are there any cooking details that you recall from that trip? Tara: I first met my partner, Tyler, ten years ago, and he sent me a text message and asked me to sell everything and go biking around the world with him. 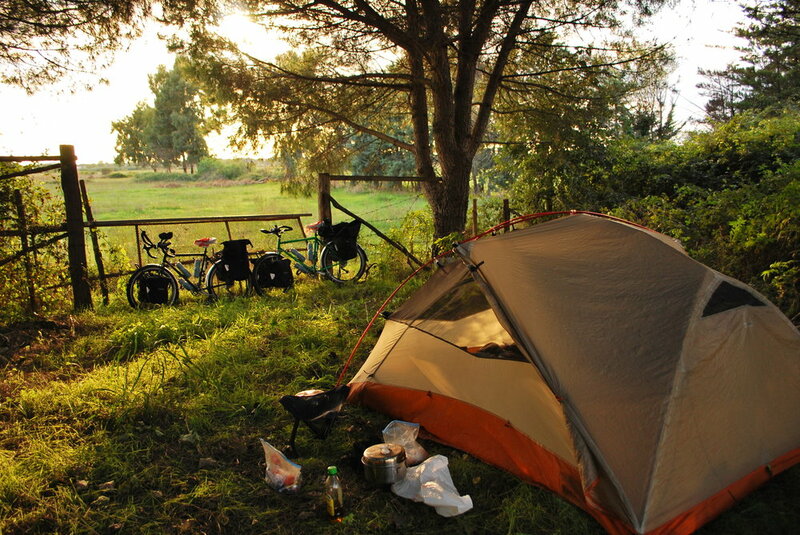 At that time, I was not a cyclist at all, and I had only camped maybe two or three times in my life before that. But I said yes, and we started planning and preparing. Because I didn't know anything about cycle touring, I didn't have any preconceived notions of what people normally ate outdoors. I just decided I was going to cook the food that I cooked at home, and so I made sure I had my pot and pan that I liked, and I assumed I was going to go grocery shopping and cook as we traveled, and that's what I ended up doing. So, if I was craving something, I would find a way to make a camp version of it. We ended up spending two years on a bicycle, camping and cooking every day, and while I had a lot of cooking experience, all of my camping experience happened during that time. MK: Was your trip literally an around-the-world tour for two years, or did you focus on certain areas? Tara: Well I guess it depends how you define world tour! We started in Scotland and ended up in Southeast Asia, with a very meandering route in between. We blogged the whole experience at goingslowly.com every day of our adventure. We probably had 700 or so journal entries from that time with all of our photos, routes, and maps. It was a very long trip. We ended up traveling through most of Europe, some of North Africa, and then we had a meandering adventure across Russia and Mongolia before finally playing around in Southeast Asia. MK: That sounds pretty perfect! Tara: It was pretty amazing! MK: Is there one particular highlight that stands out in your mind? Tara: There are so many! But one special experience was in Vietnam. 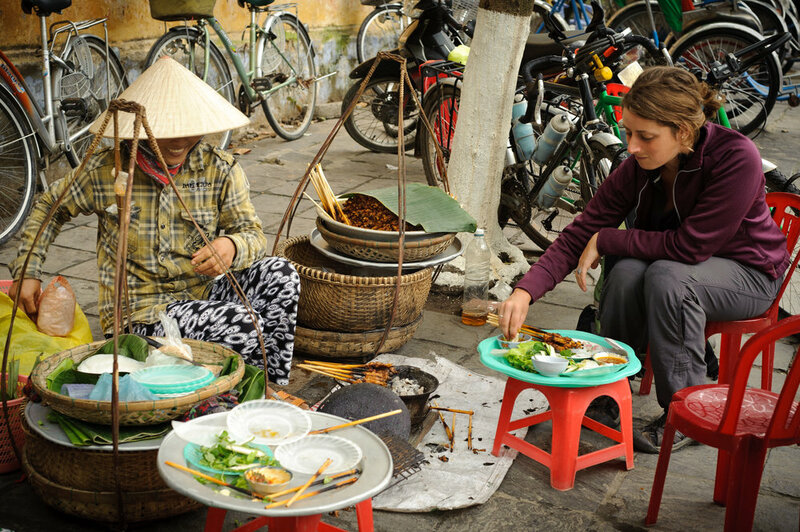 I didn’t actually do a lot of cooking in Vietnam because there was so much cheap food everywhere that was really good. But we camped one night in the middle of a mountain pass because it was going to be too far to get to the next town, so it was one of the only times that we cooked during that part of the trip. We stopped in a tiny little store and met this older Vietnamese woman. I was really nervous that there wasn't going to be anything for us, but she managed to find some noodles and things, so we were able to camp out at night and ended up eating a really delicious meal in the middle of nowhere. MK: You have a cookbook out called Bike. Camp. Cook. Were you inspired by this trip? Did you take certain culinary cues from the countries that you visited along the way? Tara: Absolutely! I process experiences through food and through writing, so for me this book was my way of encapsulating the whole trip. It's my version of a memoir in a cookbook form, so there are lots of recipes in it that are inspired by places that we visited. For example, there’s a potato soup from Scotland and a cabbage salad from Mongolia, and many more memories in the cookbook. MK: Was there a moment when you thought, I can make this happen, I can make my memoir into something other people can use. Was part of this about you wanting to help people on their own journeys as well? MK: Is there any sort of formula you have developed that could help to push people in the right direction towards demystifying what you're talking about? Tara: There are a lot of little tips and tricks you can use to make meal planning easier and as simple as possible. I love cooking and I love making elaborate dishes, but I'm constantly trying to just say, “okay, this needs to be very specific and very direct and really simple.” Something I've been thinking about recently is how there is a formula at its most basic level. Basically, you take one base ingredient like pasta, rice, or potatoes. It's often very filling and very starchy and maybe bland, so there's not a whole lot of flavour there. Then to that base ingredient you add a vegetable. It could be a can of green beans that you pick up at a gas station, or an eggplant that you get at the farmer's market, or any number of things. Then, to those ingredients, you add something flavourful that really brings the meal together. For instance, if you have pasta as your base and broccoli as your vegetable, you could make any number of dishes with the addition of flavourings. I could make an Italian dish with olive oil, garlic, and parmesan cheese, or I could make a macaroni and cheese dish with a creamy sauce. Or I could also make a curried coconut rice noodle soup that has broccoli in it. I could even make something Thai with peanut noodles and broccoli mixed in. Once you get a base ingredient and a vegetable, there's a lot of different ways you can create exciting and delicious camp meals. Obviously, there's a lot more to understanding flavours and how they work together. There's also the question of protein, but it’s just about getting a sense of all that's possible. MK: That’s a great jumping-off point. It makes it simple for people to build on. What does your camp pantry and messkit look like for a weekend trip? Tara: Well, I tend to pack very heavily and I go into a lot of detail about this in my cookbook. Basically, I have a non-stick pot and skillet that I love, along with an MSR whisper-lite stove. I always make sure I have a bag of spices with me, so that if I am somewhere where I can only get some crappy little can of something, I can turn it into something delicious. Right now, I'm working on creating systems and recipes for both weekend and week-long tours. I’m really trying to streamline everything and make it all much lighter and more accessible. The systems that are in my book are great and you can adapt them to many things. MK: Do you have any cooking failures that you can remember? Tara: Yes! [Laughs.] I’m laughing because we were in Tuscany, which is supposed to be this really amazing, romantic place. But we were stealth camping with a bunch of garbage around the site, and it actually wasn't so nice. We were almost completely out of food, but I was cooking breakfast and wanted to make an omelette. I had a little bit of baking soda, and I thought I heard that if you add a little bit, it will make an omelette lighter. Well, a lot of baking soda ended up falling into the omelette, and what we created was something so bitter that we couldn’t eat it. So there went our romantic meal! MK: A lot of your recipes involve fresh vegetables and fruits. Do you have any advice for people on how to take these on the road and how to treat them and what works better than others? Tara: Yes, I actually just created an e-book about that which is available for free on my website. It really depends on the type of touring you are doing. Ultimately, there isn’t anything wrong with dehydrated produce, but personally I would not be able to go for more than a few days of eating that way, I just wouldn’t enjoy the experience as much. If you're the type of person that really feels good when you're eating delicious produce, it’s definitely helpful to cook with fresh vegetables, It helps to break them up into different categories and to stop seeing them all as one vegetable. They all wilt and go bad at different rates. Some are sturdier while others are really delicate and can get smashed easy. I like to break them down by durability. There are the really durable vegetables – like carrots, onions, garlic, and potatoes – which all last a really long time and take a while before they'll go bad in your pannier. From there, it progresses down until you get to the other end of the spectrum, which are the really delicate vegetables like tomatoes, ripe avocados, sprouts, or a salad mix, where they're either going to get damaged quickly or rot really fast. There's a whole spectrum of durability, and I think what you can start to do is plan your trip meals around the vegetables. If you know you’re going to be gone for a while and have a few different vegetables on the spectrum, then you could have a tomato and avocado salad the first night, and the second night you might have something with eggplant and zucchini, while the night after that you could have a soup made from potatoes and carrots. You can start to gauge when you should eat what and how long things are going to last. MK: What have you learned about yourself from the adventures you take? Tara: I absolutely love getting out there. I need that in my life. It's easy to get into busy ruts, and I may not always have as much time as I would like, but it's really important for me to take the time for adventures, even if it’s only a small one. I also have learned that people are really good. Especially if you put yourself out there on a bike tour. People are really kind and generous ninety-nine percent of the time, and I think it's so easy to forget that. Cycling also helps to break down barriers between people. I think if you're doing the same trip in a car, you won’t have the same experience, and I think when people see what you're doing, there is more of a human element there. MK: I agree, that’s the beauty of cycling. See you out there! Copyright 2018 messkitmag.com. All rights reserved. Content may not be reproduced or copied without permission. Serving up fresh content since bacon met eggs.